1. 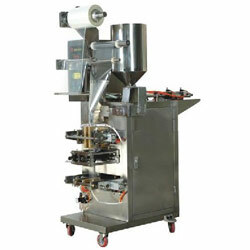 JND-S series paste-state packaging machine adopts computer controll system completely. It can finish the production's process automatically such as making bags, counting, filling, sealing, cutting, printing batch number, making the rip, and so on. It also adopts the adjustable quantificational plunger pump, and it is specially uses for something which easy to drawbench or dript as shampoo. 2. Sealing type: the bag can be sealed on three sides, four sides, or pillow. 3. Packaging material: paper/PE PET/al foil/penylon/PE, tealeaf filtering paper & ect. 4. Extra cost: hot stamp ribbon coder (color style, ink wheel style). 1. Model: JND-S100. 2. Capacity (Pcs/min): 20-30. 3. Packing range (ml): 10-100. 4. Power(kw/V): 1.3/220. 5. Length of bag (mm)(max): 160. 6. Width of bag (mm)(max): 140. 7. Dimension (L x W x H)(mm): 1400 x 1000 x 1800. 8. Weight(kg): 280.